I have a girl crush on Stacy London. Back when I had cable, I watched her on "What Not to Wear" every week and wished I could go shopping with her. She is so funny and lively and chic! She seems like a woman who has it all. Her book, "The Truth About Style" was surprisingly personal. 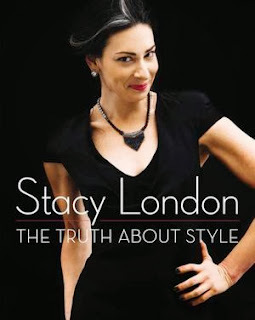 It was a relief to find out that the fabulous Stacy London also struggles with body image and confidence issues. As a child, Stacy suffered from a severe outbreak of psoriasis, an autoimmune disorder that left red welts and crusty skin all over her body. She said she spent years wearing only turtlenecks and long pants, even on the hottest days. She felt like a freak, and the kids in her school made fun of her. She eventually recovered from psoriasis, but in college she became anorexic, her weight dropping down to 90 pounds. Later, she couldn't stop binge eating and her weight climbed to 180. Stacy, now in her 40s, said her weight still fluctuates a bit, but she's smarter about knowing how to dress her body. "Style, unlike fashion, is personal. It's about the individual. You have to know yourself in order to utilize style. Style isn't selling you a false promise. It's reality based, and operates on the knowledge of what is right for you. ... Style is about enhancing who you are, and not attempting to look like someone you'll never be. With style, there are as many ways a woman can look beautiful as there are women." After sharing her story, Stacy introduces nine different women, each one who needs help with their style. Some women don't know how to dress for their age or a change in weight, others have trouble finding clothes because they're curvy or plus-sized or tall or petite; one is a breast cancer survivor who wants to feel feminine again, another is a perfectionist and is scared to buy anything in case it's the wrong choice, and one is a busy mom who hasn't bought anything for herself in years because she gives it all for her kids. Stacy said she solicited appeals from hundreds of women who wanted a style makeover, which she calls "start-overs," and she picked nine women who represent problems lots of us face. "Making excuses and letting fear rule our style stop us from expressing our true selves and what we could look like at our best. We get in the way of our own potential instead of reveling in it. Negative thought-loops are self-perpetuating. If we don't like what we see in the mirror, we either ignore it or we overcompensate for it ... By changing your style, you're forced to change the way you perceive yourself. And if you can see yourself differently, you can start to feel differently. If you put on clothes that actually flatter your figure, you suddenly may not feel as badly about your body anymore. When you think positively about one aspect of yourself, it becomes easier to believe in yourself in lots of different contexts." "Nobody is perfect. Don't approach the mirror and hope, each time, that you'll look like someone else. You're going to be disappointed if you do ... No matter how much you subjectively love or hate your shape, it's still the same body you're going to wake up with each morning. Stop exhausting yourself hoping, wishing, praying to be someone different, and take pleasure in knowing that you are who you are, in all your fabulous uniqueness. Go about the business of working with that real body to create a style you love and can love your shape in." At the back of the book, Stacy includes a shopping guide of stores and designers for different women's needs, such as plus sizes, petites, glamazons, shoes, denim, etc. I would recommend this book to any woman who feels like they are stuck in a style rut and needs a boost to get out. It's like getting a hug and helpful nudge from a fabulous friend.